on stock cars during the race weekend following his death. The holiday season is upon us and I must admit my mind is full of a thousand different thoughts. The thoughts run the gamut from how will Matt Kenseth do at Joe Gibbs Racing in a Toyota with teammates Denny Hamlin and Kyle Busch, to whether I’ll get to another NASCAR Sprint Cup Race in 2013. Then my thoughts settle down. I recalled recently a conversation I had on the Friday of the Homestead-Miami Speedway Championship weekend. I was canvasing everyone I met about their Simple Joys. It was a question that allowed me to share intimacies in a limited time with NASCAR’s greatest across all three of the top tiers. In the Camping World Truck pits I stumbled upon a man I had not met before and, quite frankly, had never heard about in my travels. I instantly took a shine to this man who I’ll call B. B was funny, irreverent, and charming. He gladly answered my Simple Joys question in both a humorous way and a more sincere one. I noticed B wore a rubber bracelet around his wrist akin to the “Live Strong” ones that have been popular for years. B’s bracelet read “Remember” so I asked him about it. B told me that he was very good friends with the late Dan Wheldon of IndyCar fame. They were the best of buds. After Wheldon’s passing B put a lot of thought into his life and his feelings. Then B had an epiphany of sorts. He wanted to remember Wheldon forever, which was going to happen anyway, as Wheldon was sewn into the fabric of B’s life. But B also wanted to remember that "Life is Short" and to "Live Life to the Fullest." Although the phrases seem cliché, they are apt and appropriate. Only those who have endured what B, Wheldon’s widow Susie, their children, and other close friends and family of Wheldon have could truly grasp the importance of those expressions. What was most lovely to me was the fact that although B missed his friend daily and acutely, he was so full of life and joy. He took every opportunity to speak of his friend with me, not to gain publicity, but because he knew we had connected and I was a willing student to the life lessons B was trying to impart. Death affects as all so differently. When one of our sports stars – our heroes – dies at the pinnacle of his career it is difficult to process. Those of us who adored Dale Earnhardt were forced to accept the unacceptable in 2001. There is still much sadness associated with the NASCAR superstar’s untimely death. For many, Wheldon’s passing dredged up feelings still too near the surface of Earnhardt’s death, Davey Allison’s, Alan Kulwicki’s, Neil Bonnett’s, Kenny Irwin’s, Clifford Allison’s, et al. After speaking to B, though, I was soothed by our conversation. 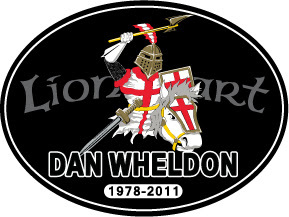 His philosophy, stories, and calming nature showed me that those closest to Wheldon are healing, including his widow. I never expected to randomly walk up to a man in the pits at Homestead-Miami Speedway and gain so much insight. The connections I made that day were strong and priceless. NASCAR has given me much in life: a connection with my husband, a sport to call my own, tons of new friends from around the world, and a deeper understanding and appreciation of the fragility of life. I have been given a great gift this year. The connections I have made through NASCAR are yet more valuable reasons why I love NASCAR. A particularly poignant blog at this time, well done Chief ! Very well written and a great article Chief!